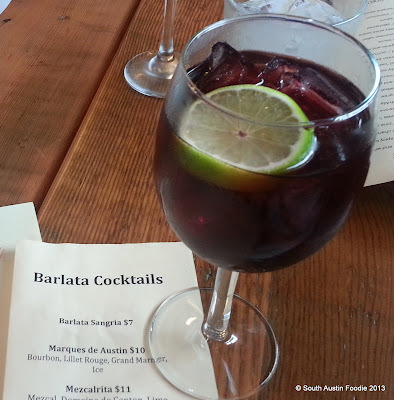 In case you've been away from Austin this summer, Barlata is finally here. After close to two years of rumors that Daniel Olivella (a Spanish chef, by way of San Francisco) would open a tapas restaurant in town, the doors opened the beginning of July. Immediately, there were rave reviews. 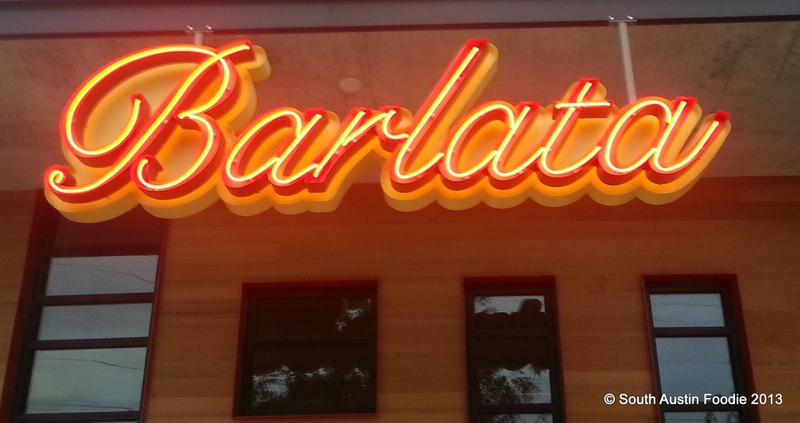 I've waited a bit to let things settle down, but I have been excited to try Barlata. Located at 1500 South Lamar, Barlata occupies a street-level position at the Post South Lamar apartment complex; parking is available in the garage behind the building. I'll call the interior and decor a modern industrial look, but without the coldness that often comes with that style. Service was extremely good throughout our visit. Water glasses were regularly attended to, finished plates whisked away, and our server was knowledgeable about the menu. And happily, when we arrived on a weekday at 6 pm, they were not that busy; by 7 pm they were at least half full, and by the time we left around 7:45, it was 80-90% filled, but there was no line waiting for tables. And on to the food! We started with the cheese plate, which is probably the only dish that I would not order again, only because the value is not there. (But in their defense, most cheese plates are not a good value.) It's great to have the variety of 6 cheeses, but they are such thin slices. At $12, I'd rather have three cheeses, and thus more quantity of each. This is certainly a sampler plate. And at a table of four, we each got half a piece of toasted bread. 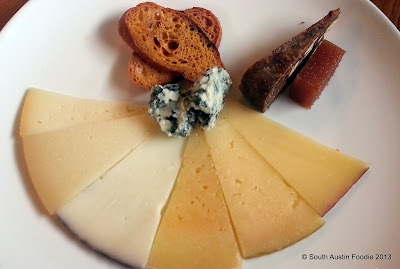 The fig cake and quince paste are good traditional pairings with the cheeses. Fortunately, the food and value got better as we went along. 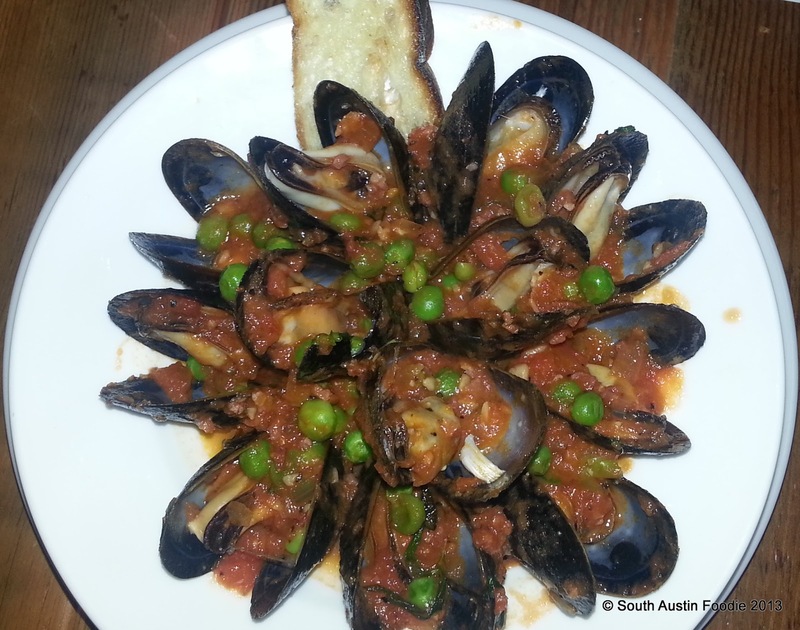 Next were the Mussels in Sofrito. Delicious, and well worth their $9 price tag. Beautifully presented, the sofrito (generally a sauce made from onions, garlic, and tomatoes) and the green peas gave a nice pop of color and presentation. 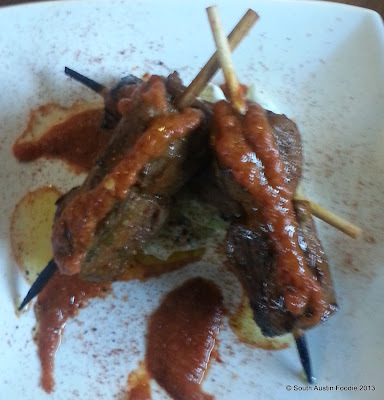 While my Lamb Brochette picture did not turn out exceptionally well, this $9 plate was delicious, though I am partial to lamb. The meat was grilled to a nice medium rare, was savory and juicy. I think I was too excited about the lamb to remember much about the sauce with it. In Spain, a tortilla is an egg dish, not a type of bread that comes in flour or corn. 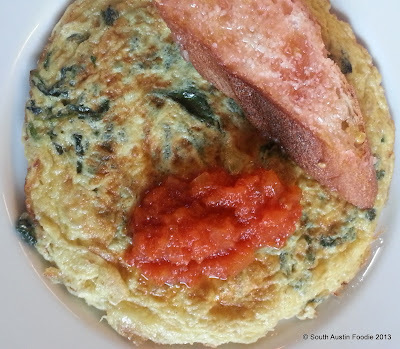 This is the Tortilla Espinaca, with spinach and Manchego cheese. The tomato sauce/relish had a really nice kick to it, and certainly made the dish more interesting. The pan con tomate (bread rubbed with tomato) was a bit soggy from the condensation. Barlata offers 10 different paellas, including a vegetarian option and two made with fideua (fideo, or vermicelli pasta). 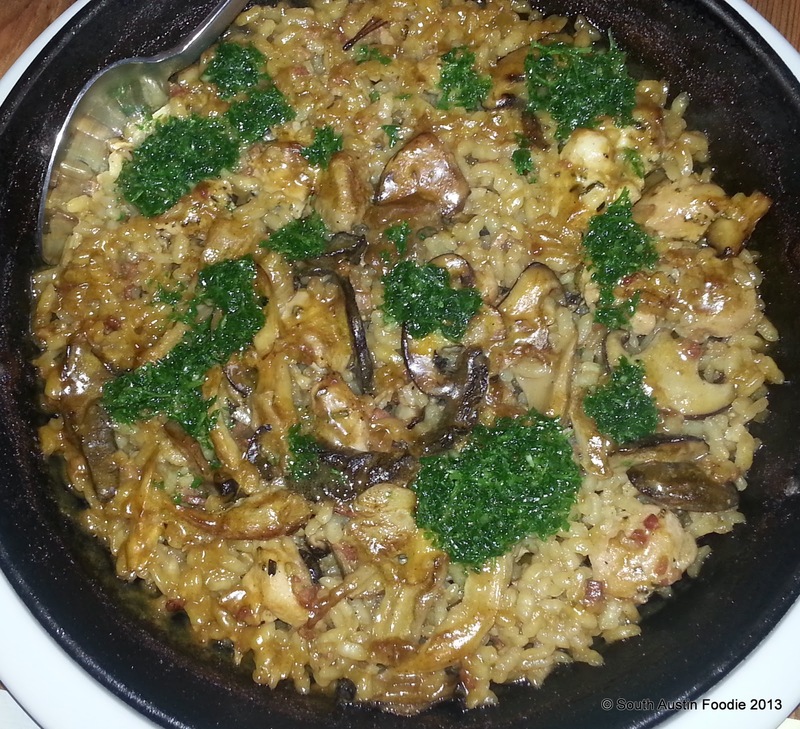 We picked the Arros Cacadora, made with rosemary instead of saffron, and chicken, rabbit, pancetta, and mushrooms. As you may be able to tell from the sheen, the dish was on the oily side; I also don't recall finding any pancetta in it, and the rice was not crispy on the bottom. But despite these, it was still incredibly tasty. The mushrooms really added a nice depth and that umami quality to it. This was the "small" size, which was in an 8 or 9 inch paella pan ($15), and with the other items we ordered, was perfect for four people. And a meal would not be complete without dessert. 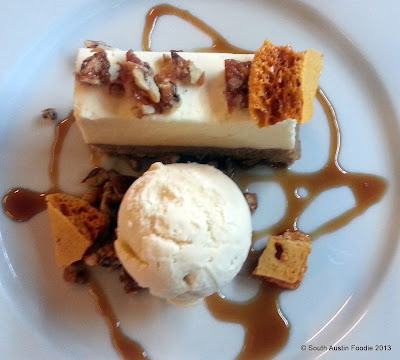 There was the Mel i Mato, a traditional Catalan dish, of goat cheese mousse (or I'd say cheesecake) on top of a walnut crust with a oloros (sherry) ice cream and caramel drizzle. It was really delicious. And then there was the Crema Catalana. This is probably one of the single best desserts I have had at a restaurant, so simple and clean. 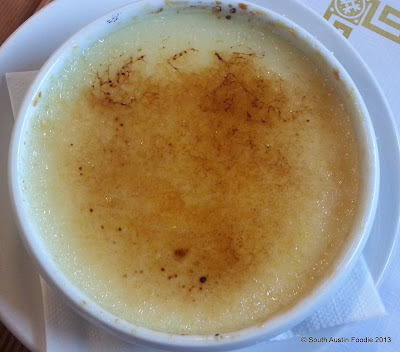 It's the Spanish take on creme brulee; Barlata's is lightly infused with lemon, and while it's rich, it's not overly decadent. The "crema" was so velvety smooth and contrasted nicely with the caramelized sugar crust on top. Worth every single penny and then some. 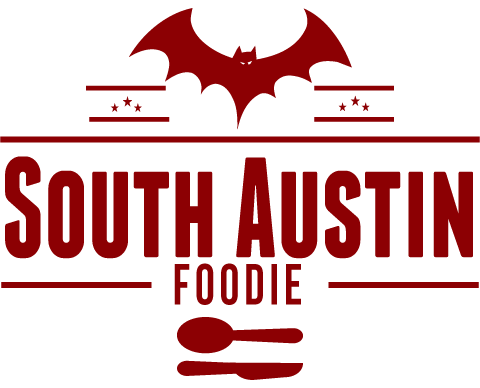 I would go back just for the Crema Catalana, but fortunately there are other things on the menu that I am interested in trying. Barlata has happy hour Sunday through Thursday, from 5 - 6:30 pm in the bar area only. From their social media posts, it appears each day has a different drink and food offering. 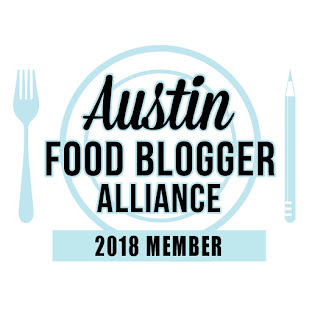 It's a great addition to the growing Austin food scene, and I am extremely happy to have Barlata in my backyard. Loved what I had here. I wish I had room for dessert. I went on my birthday with Alan. Loved the Oxtail! Looking forward to trying Barlata. Great write up! Thanks, Chris! I look forward to returning!